An Adventure-Friendly World, which, no matter how Technology Marches On, remains firmly rooted in the cultural and political sensibilities of the age of Wooden Ships and Iron Men. Many works of modern fantasy or speculative fiction are set in a mostly watery world, or a mostly watery part of a world where the rest isn't of much matter, with distant islands connected by trade routes, ships sailing back and forth, different types of City on the Water, and mighty colonial nations vying for rulership of the oceans and seas. Also often called Pirate Punk, as the setting naturally lends itself (but is by no means obliged) to have many Pirates and buccaneers, whether they're wielding cutlasses on sailing ships or the aquatic equivalent of Humongous Mecha. May contain Organic Technology, and have a large focus on what happens under the waves, where there might be an Underwater City, as well as over. Fantastic elements based on old sailors' superstitions (mermaids, abandoned derelicts that often aren't so abandoned after all, giant sea monsters) also make a frequent appearance. Groups that are Born Under the Sail tend to be common. This may also be a type of After the End setting, if the writers are trying to teach An Aesop about global warming. Or they just thought it would be cool to show a world where our mostly land-based culture and technology ends up being adapted for an existence on the ocean. For a similar setting that trades the water for the skies, see The Sky Is an Ocean, which will likely feature Sky Pirates. And since Space Is an Ocean, you might have Space Pirates. Compare and Contrast its exact opposite Desert Punk. Not to be confused with seapunk . Children of the Whales is this more than Desert Punk, as they move around endlessly on an ocean ... that just happens to be sand. The world of One Piece has very little in terms of land mass, being made of mostly giant oceans, the Grand Line, one giant continent running around it like a ring and many many islands. As such, most of the story is set very close to water, with the protagonists being pirates (the nice kind) and the antagonists being mostly bad pirates, bounty hunters and the Marines. On top of that, transponder snails take the roles of telephones and cameras, seashells called "dials" act as weapons of mass destruction, and it has heavy stylized architectures and a mythos that oozes old-timey pirate lore. Blue Submarine No. 6: The story of a war between an army of Fish People created by a Mad Scientist that flooded the world, and the fleet of submarines that are humanity's last hope. Daphne in the Brilliant Blue is set hundreds of years after the planet was flooded by global warming, and the only remnants of humanity are the descendants of several underwater cities that resurfaced and colonized the remaining landmasses. Siberia is now a tropical vacation paradise, virtually all transportation is submersible or seafaring to some degree, and all of the Action Girl heroines frequently have to strip down to improbably skimpy swimwear when going into battle. Mars Daybreak takes place in a futuristic Mars that had been completely flooded. Gargantia on the Verdurous Planet is set in the distant future, where the human race has fled the earth to escape from a new ice age and is now locked in a battle with the superpowered space squids known as Hideauze. Part of it anyway, and they only get screen time at the beginning of the first episode. The other part somehow sat out the ice age on earth, which has turned into a giant ocean with absolutely not a single piece of land above water somehow, having a live and let live relationship with the resident superpowered ocean squids known as Whale Squids. The earth part of humanity, where all the story happens, survives by pillaging sunken ships and submerged ruins and connecting dozens to hundreds of ships to enormous fleets such as the eponymous Gargantia. While the space humans have incredibly powerful futuristic spaceships, cannons and multiple types of powerful Humongous Mecha, the weapons of the earth humans are WWII era guns and battleships as well as the Yunboroids, far less futuristic mechas, although they are mostly used for salvaging, transport and maintenance. Oh, and there's pirates and a "boat partly submerged by the weight of a mecha" episode because there are no beaches anymore. ARIA takes place in a Mars that is not only terraformed to be an ocean world but also had built a replica of Venice as its capital city. The protagonists of this sci-fi Slice of Life made a living as gondoliers. Agent Aika takes place in a future that had been mostly flooded. The titular agent was one of various salvagers. Tactical Roar: The titular Perpetual Storm (a super-hurricane that affects the entire Pan-Pacific territory, and has done so for fifty years by the time the show starts) makes aerial transportation impossible on that area, bringing about a resurrection of the naval age with modern and futuristic ships (the main characters are part of a private security company that mans an Arleigh Burke-class destroyer). Swordquest: Waterworld is a fantasy version of this trope. The Multiversity's Earth-31, based loosely on a pirate Elseworld from 1993's Dectective Comics Annual is "a post-apocalyptic drowned world" where "CAPTAIN LEATHERWING and the crew of the Flying Fox - including ROBIN REDBLADE - fight to protect the safety of the seven seas". Moana has elements of this. Most notable are the Kakamora, pigmy fantasy pirates living on interconnected ships so big that they're virtually floating islands. Waterworld is definitely the aesop version, created when runaway global warming floods the entire planet save for the tip of Mount Everest. Humans mostly inhabit "atolls", ramshackle floating villages built out of whatever junk and flotsam could be scavenged from the sea, but there are also Drifters who spend their entire lives sailing nomadically between villages on one-person boats, aquatic mutants with gills behind their ears, and the Smokers, feared pirates with access to the only remaining motor craft. It's also mentioned that things like food plants and soil have become rare and valuable luxuries. Pirates of the Caribbean concentrates on the eponymous pirates in the eponymous carribean and their wacky mostly water based adventures with pirates, pirate zombies, marines, pirate fishmen, ocean deities and a jar of dirt. The planet Kamino in Attack of the Clones, home of the cloning facilities of the Republic, once had landmass but now it doesn't. The only thing left are cities on pillars and one giant and very very stormy ocean. Older Than Print example and assuredly the Trope Maker and Trope Codifier is The Odyssey most of the adventures in the early part are set on sea, concern sailors, winds, islands and the ocean is frequently described as a presence called "the wine dark sea". Web Novel series Calenture takes place in a steampunk setting that somewhat resembles the Pacific Ocean. Ursula K. Le Guin's Earthsea setting. Settings like these may be in part inspired by the story of Noah and other 'great flood' stories from folklore and mythology. Except that the C plot (Malta) takes place almost entirely on land. Plot lines A (Althea) and B (Wintrow) certainly qualify, though. The Scar by China Miéville features Armada, a floating city made of hundreds of ships all lashed together, patrolled by underwater police led a dolphin and pulled around by a colossal Sea Monster. Tranquilium starts out overwhelmingly maritime, with the human population being concentrated on islands of various sizes. At the end, it becomes an extreme example of this trope as most of the world's known landmasses are submerged and the population moved to huge arks that travel in search for new lands. The parts of John Birmingham's Without Warning that deal with the crew of the Aussie Rules. Taylor Anderson's Destroyermen series is set in the Pacific Ocean of an alternate Earth where that pesky asteroid never wiped out the dinosaurs so it qualifies. Since the main characters are the crew of a WWII era destroyer that ran afoul of a time-space rift it also has elements of Diesel Punk. Throughout the series, we see many different types of ships, from junk-like fishing boats armed with ballistae to carrier-sized wooden Homes (several of which later undergo refits to become carriers), from East Indiaman-derived frigates and steam/sail hybrids to World War I and World War II-era ships (including a submarine). This series has as much Schizo Tech as it can fit, short of putting Frickin' Laser Beams or missiles on wooden ships. Book 7 adds Grik-built ironclads, including Azuma-class cruisers (based on the design of the French-build Japanese ironclad Kotetsu ) and Amagi-class battleships (large four-stacked versions of the CSS Virginia ). The second Pendragon novel, The Lost City of Faar, takes place on the territory of Cloral, which is covered entirely by water until the mountain of Faar is raised at the end. Cloral has generally advanced technology, including water guns that can blast through walls, plastic made from processed water, and water-based propulsion systems, with specialized floating cities called "habitats" housing residents. Katya's World by Jonathon L Howard, set on a Water world colonized by Russians where everyone either lives in communities carved out of undersea mountain ranges or on platforms floating on the surface and set after a war with the mother world. Dark Life: After the ocean has raised and washed away the Earth's oceanfront property, Determined Homesteaders in underwater farms have to battle pirates, a corrupt government, and in the case of some of the characters Fantastic Racism from being born with super-powers. Most of Wen Spencer's Endless Blue takes place in the Sargasso, a pocket universe which is mostly water dotted with islands, some of which fly and is populated by several races, including humans all of whom are descended from spaceship crews that wound up stuck there. A humorous example is Sense and Sensibility and Sea Monsters by Ben J. Winters, an Affectionate Parody of the Jane Austen book set in an England beset by hostile sea creatures. Michael Crichton's Sphere occurs on its majority on a U.S. Navy Underwater Base at the bottom of the ocean, and there is a constant mention of how the extreme depths are a challenge for both man and machine (even something as simple as cooking gets a whole lot more complicated when done in a helium/oxygen environment). Peter Watts Rifters Trilogy which is about cyborgs working in the deep sea. The Crystal Maze replaced the Industrial Zone with the Ocean Zone in later seasons - a Titanic-style sunken ocean liner trapped within an air bubble on the ocean's floor. Storm World is a juvenile SF series set on a world where the inhabitants (all sucked there through wormholes) are constantly at odds because of the scarcity of land, and above all fresh water. seaQuest DSV involved the titular super-submarine, created by the Fictional United Nations "United Earth Oceans" (or UEO) to police the many underwater habitats of the world and protect it from the myriad bad things that happened, including (in its final season) a despot trying to Take Over the World. Sea Quest's Spiritual Predecessor Voyage to the Bottom of the Sea involved the Cool Boat and advanced submarine Seaview roaming the oceans of the free world fighting dastardly communist plots, alien invasion attempts, supernatural phenomena, mad scientists, technology gone haywire, unscrupulous people deciding to exploit the Phlebotinium Du Jour located at the bottom of the ocean without caring about the apocalyptic collateral damage that they may create and many monsters, both ocean-born and in the occasional uncharted island. The Detroit techno group Drexciya has this as part of their aesthetic and backstory. The story goes that during the days of the slave trade, pregnant women were thrown overboard. Over time the unborn children had grew to be underwater warriors, built bubble cities underwater, and are planning to attack the surface and return to the homeland. FASA Traveller module Rescue on Galatea. The main action takes place on the Ocean Planet Galatea. Dungeons & Dragons module Q1 Queen of the Demonweb Pits. One of the alternate worlds accessible from Lolth's Web was the Ocean Planet "The Great Ocean". The human inhabitants "sail the ocean in great catamarans to carry the trade of their vast mercantile empire from island city to island city." The Crowded Sea in the Al Qadim campaign setting (a subsetting of the Forgotten Realms), explored in the Corsairs boxed set, serves this purpose. The 3.5 sourcebooks Stormwrack is a supplement to help DMs create their own Ocean Punk setting more easily. It also expands upon the rules related to ocean travel. One of the Ravenloft domains, Saragoss, is an Ocean Punk Crapsack World setting in which stranded vessels' crews fight over dwindling resources on a drifting mat of seaweed. Rifts World Book 7: Rifts Underseas — Pirates, Powered Armor-wearing dolphins, shapeshifting orcas, giant squid Eldritch Abominations with tentacles miles long, fish-headed mutants, magic singing, playable humpback whales, floating cities, extradimensional aquatic conquerors, and the U.S. Navy, among others. All pretty par for the course for Rifts. The game comes back to the sea with Rifts Lemuria, with Biomantic armor made of wood, coral, barnacles and blood (among other things); merpeople; giant junk-collecting hermit crabs; stone aircraft; and Giant Enemy Vampire Crab-people literally from Davey Jones' Locker. Owing to the fact that the Elemental Pole of Water is located there, this tends to be the theme of any Exalted campaign set in the West. Common hazards include cannibalistic demon pirates, water and air elementals, ornery storm deities, aquatic variants of The Fair Folk, Magitek Lost Technology battleships (some of which may be sentient), gigantic sharks, crazed Wyld mutants, various tribes of aquatic Beastmen and the Lunars who rule them, malevolent empires of the dead... in fact, according to the Sidereals splatbook, the Convention of Water is the single most overworked group of Sidereals in existence. Considering that the job of the Sidereals is to keep Creation from going to pieces, this should tell you a lot about the West. 50 Fathoms is all about the swashbuckling piratey oceanpunk goodness. In the RPG Blue Planet (by Biohazard Games, now printed by Capricious Games), a colony on the ocean planet of Poseidon has regained contact with Earth after the homeworld succumbed to a planet-wide blight, leading to the clash between the Mega-Corporations and the government of an Earth that is dying out, the Earth colonists that have had to adapt to the planet when contact was cut off, and the native lifeforms of the planet, with the resources of the planet (including a substance that allows for an increased ease in biological modification) on the line. Bizarrely this trope plays out on Rocket Age's Mars of all places, which has seas of silt, pirates, whalers and merchants hopping from island to island. The oceans of Jupiter's moon Europa in Eclipse Phase, full of Uplifted Animal, underwater-sub and underwater-breathing-modified morphs doing hefty amounts of cloak-and-dagger action. The /tg/ original setting CATastrophe combines this with the aesthetic of Solar Punk, the disappeared ice caps of Global Warming, and uplifted animal people replacing the extinct human race. BIONICLE's Mahri Nui arc took place in an underwater setting, complete with Fish People, underwater vehicles and robots, a sunken city, Eldritch Abomination-like sea monsters, and vampiric squid. Lego Pirates was a more historical take on the trope, but still generic enough to qualify. The Legend of Zelda: The Wind Waker, and its sequel Phantom Hourglass, mixed up the usual Zelda formula by changing its setting to an oceanic world. Notably, the Great Sea of the former game is an After the End world, being what remains after the ancient kingdom of Hyrule, as seen in The Legend of Zelda: Ocarina of Time, was flooded by the gods in order to protect it from Ganondorf when the Hero of Time did not reappear to save it. The islands of the sea are actually the mountaintops of the ancient kingdom. Suikoden IV featured a setting like this, though it was set in an island country rather than a flooded world. Skies of Arcadia is Pirate Punk and Sky Pirates with more emphasis on the former (at first). Characters travel between floating islands in flying 18th-century pirate ships (which later get upgraded to more modern-looking battleships). You play as a small band of pirates trying to take down the evil armada. Sonic Rush Adventure is set on a cluster of islands where the main villains are robotic pirates. Submarine Titans, which is basically StarCraft IN UNDERWATER! Sleeper Xbox title Blood Wake is like this. The story suggests there's plenty happening on the game world's mainland, but since the protagonist is part of a pirate group who base themselves on islands and make a living preying on nearby shipping channels, all their warfare (and gameplay) is naval. Assassin's Creed IV: Black Flag, which takes place during The Golden Age of Piracy and centers heavily on the Caribbean Sea, with civilization scattered across small islands of varying distances that have to be crossed by ships across waters filled with sharks, whales, dolphins and jellyfish, and features quite a bit of ship-to-ship combat. Submerged is set on the remnants of a metropolis, whose tallest building are now like an archipelago of small islands. Mega Man Legends takes place in a world covered by endless water. The Monkey Island series takes place on various islands throughout the Caribbean, and although it takes place during The Golden Age of Piracy there are plenty of anachronistic elements like grog vending machines, pirate action figures and even a voodoo-powered giant robot. The Dishonored franchise is essentially a combination of this and Victorian Diesel Punk. While the usual pirates, marines and ghost ships don't appear, the more time-accurate whalers and their prey, strangely magical whales do, alongside a humongous ocean with little but a few islands where the empire of Gristol lies. So, while the setting is ocean-punk-ish, you never actually go to the ocean. From the Depths, a block-based building vehicular combat simulator, originally squarely in the Ocean Punk territory with Wooden Ships and Iron Men, set on a world with wildly unpredictable weather and little land. Updates and scope changes have increased the breadth of it, leading to sail-powered blackpowder-toting brigantines fighting alongside composite-clad particle beam cannon nuclear submarines with Zeppelins from Another World providing anti-missile screens and advanced targeting data. Very much the setting of Sunless Sea. The Zee makes up most of the map as you sail between islands dealing with various threats such as giant sea creatures, starvation, and madness. The Pirate's Fate is a fantasy example, set in a mostly bright and sunny Mediterranean setting mostly at sea, but it ticks all the appropriate "punk" boxes. From the surprisingly dark story to the truly vile antagonists and the focus on reactions to an adventure that costs dearly, it doesn't skimp on the attitude. In Homestuck, Post-Scratch Earth turns into this once Betty Crocker takes over and Alterniaforms it into an ocean planet, the waters broken only by floating slums of prefab housing blocks where alien exiles eke out an existence and by Dirk's home on top of a ruined skyscraper poking above the waves. The Pirates of Dark Water: combined Sword and Sandals, Magitek, Organic Technology, and Wooden Ships and Iron Men, with this. This early 90s cartoon series was an epic seafaring adventure starring a Rag Tag Bunch Of Misfits on an oceanic alien planet called Mer, where ships are powered by sail, and sea serpents are an every day thing. Jabberjaw is set in a future where the ocean floor has been colonized. The Deep has many of the aspects of this (focus on life under the waves, pirates, etc. 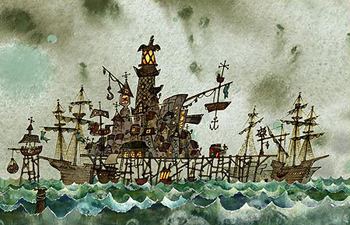 ), but is about a family of explorers who choose to live under the sea rather than being about a flooded world. The Comic Strip: The Tiger Sharks segments take place in the ocean planet Water-O, and as a result most of the cast is capable of breathing underwater (although the protagonists had to undergo a transformation to do so) and most of the vehicles are capable of underwater travel.